Our Stars at Yerkes teachers have planned a year of exciting and interesting workshops for teachers and informal educators who want to learn more about astronomy and the exploration of space. Registration for these workshops will be available online as the event approaches. Workshop will be held at Yerkes Observatory from 2:30 am to 9:00 pm. Please join us for a relaxing afternoon and evening at historic Yerkes Observatory to learn how Yerkes Outreach Educators have incorporated STEM into their classrooms. An overview of some of the authentic science experiences you can bring to your classroom by attending workshops will be presented by Stars at Yerkes Outreach Educators. In the evening, we invite you to bring that old telescope that's been lurking in the attic, and we'll help you set it up and train it on Mars! The Stars at Yerkes Lunacy IV Workshop will focus on turning your students into Moon Gazers. You will learn how to engage students to explore the solar system’s basic geological processes using the Internet award-winning video game "Selene". Learn about "MoonWorld " and show students how to help scientists map the moon using the "Moon Mappers" Project. The workshop will provide an opportunity for international collaboration using the iCollaboratory’s “Moon Over Us” project. Hear about some newly developed materials associated with Gerard P. Kuiper’s Moon Hemisphere, an artifact from the 1950's that was used to map the Moon's surface. Learn about crater counting and how to take lunar images using MoonKAM. Public Star Party Event - Join us at the Lions Field House, clear or cloudy, on September 22, 7:30-9:30 pm, as we celebrate our celestial neighbor for International Observe the Moon Night (observethemoonnight.org), co-sponsored by the Williams Bay Rec Department and Yerkes Observatory Educators. Click here for a preview of what's up in the night sky this month. Interested in Radio Astronomy, but unsure about Pulsar Search Collaboratory West training? Come to Yerkes Observatory to learn how radio astronomers study the invisible universe. Hear the story behind radio astronomy and the 100 meter Green Bank Radio telescope. Learn to analyze radio data to discover pulsars. Workshop activities include: a talk by a radio astronomer about the importance of pulsar research; exploring the sky for radio sources with the 20-meter radio telescope in Green Bank, WV using Skynet; Touch the Invisible Sky, A Multi-Wavelength Braille Book featuring Tactile NASA Images, by Noreen Grice, Simon Steel and Doris Daou; and using the Itty Bitty Radio Telescope at Yerkes. This will be an introduction to Radio Astronomy with an emphasis on discovering pulsars. Opportunities to have access to data you students can use to find more pulsars will be shared. This workshop is part of a detailed pulsar workshop weekend presented by staff of the Green Bank Radio Telescope in West Virginia. Details about that training are found here. Register for our Public Star Party on October 20th from 7:00 - 9:00 pm. Learn the fall constellations and see many deep sky objects through telescopes. This star party will happen if skies are clear or cloudy. There will be indoor activities if the sky is cloudy. Activities are designed for school age children accompanied by a parent or teacher. We invite you to join “MESTA on the Road” for a journey of discovery using the Galileoscope. Teachers from the Michigan Earth Science Teachers Association will lead you in activities that explore optics, the history of telescopes, our Moon, and solar astronomy. The aim of this workshop is to provide you with the tools to do more astronomy with your students. Please bring a camera tripod with you to the workshop, as well as a laptop computer. All workshop participants will also receive a copy of The Center for Science Education's (UC Berkeley) new Cosmic Serpent book! Just added: all workshop participants will receive a Miller Planisphere! Register for our Public Star Party on November 17th from 6:00 - 8:00 pm. Learn the late fall constellations, and catch the slim waxing crescent Moon. View many other objects through telescopes, and learn from our volunteer astronomers. This star party will happen if skies are clear or cloudy. There will be indoor activities if the sky is cloudy. Activities are designed for school age children accompanied by a parent. Dress warmly! Workshop will be held at Yerkes Observatory from 2:00 pm to 5:00 pm with Star Party observing from 6:00 to 8:00 pm. At this special session on for Stars At Yerkes, high school students are invited to experience life as an astronomer. While visiting the historic observatory, observing techniques will be the focus of our discussions. Students will have hands-on experience with telescopes, will meet with an astronomer, and be given a tour of the observatory. Afternoon session begins at 2pm and ends at 5pm. Observing will begin at 6pm as dinner ends. The event concludes at 8pm. Cost $15 (includes pizza dinner and both the afternoon and evening session) $5 if only attending the evening observing session. This cost is per student. Chaperones (one per school) are free. Register below no later than Friday, November 23, 2012. Register for our Public Star Party on December 1st from 6:00 - 8:00 pm. Greet the winter constellations before the waning gibbous Moon rises. View Jupiter's moons and many other objects through telescopes, and learn from our volunteer astronomers. This star party will happen if skies are clear or cloudy. There will be indoor activities if the sky is cloudy. Activities are designed for school age children accompanied by a parent or teacher. Dress warmly! There will be NO January public star party. There is a strong connection between the Sun, Earth, and the Aurora. 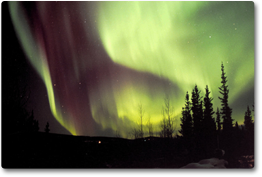 This workshop will look at the aurora and explain how they are formed due to the processes that occur on the sun. This will also be a good time to take a look at the sun, its layers, and the spacecraft that observe the sun and are used to predict space weather. Participants will also learn about the space weather predictors used by scientists and what websites they can go to for aurora prediction. An aurora demonstration will also be provided. View the waxing gibbous Moon and Jupiter and its moons. View many other objects through telescopes, and learn from our volunteer astronomers. This star party will happen if skies are clear or cloudy. There will be indoor activities if the sky is cloudy. Activities are designed for school age children accompanied by a parent. Dress warmly! Update: Book selection has been made!!! Come observe the night sky, with backyard telescopes and activities designed for school age children accompanied by a parent or teacher. The waxing crescent Moon along with Jupiter and its moons should be great observing targets. View the constellations of the springtime sky, and learn from our volunteer astronomers. Come observe the night sky, with backyard telescopes and activities designed for school age children accompanied by a parent or teacher. View the setting Jupiter in the twilight, and see Saturn rising around 8 pm. View the constellations of the springtime sky, and learn from our volunteer astronomers. The waning gibbous Moon will not rise until 10:30 pm, so skies should be dark. This star party will happen if skies are clear or cloudy. There will be indoor activities if the sky is cloudy.